Beautifully engraved certificate from the Frankford & Southwark Philadelphia City Passenger Railroad Company issued no later than 1937. 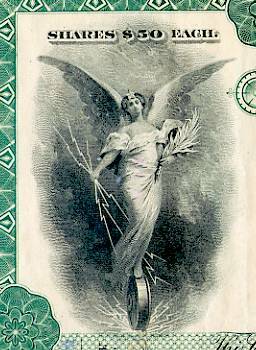 This historic document was printed by the Hamilton Banknote Company and has an ornate border around it with a vignette of an allegorical woman with wings holding lightning bolts in her hand riding on a wheel of a train. The certificate shows period cancellations through signatures. This item is hand signed by the company�s president and secretary/treasurer and is over 69 years old. In May, 1857, the Philadelphia and Delaware River Railroad was chartered, giving the right to build a road from Philadelphia to Frankford, upon which cars drawn by horses could be used. Horse cars were in use from January 8, 1858, to November 17, 1863, when the Frankford and Southwark Passenger Railway introduced "dummies" which ran from the depot, Fourth and Berks Streets, to Frankford. The first was called the Alpha, and the second the Sea Gull. As other cars were added, the were called No. 1, 2, etc. The engine was on one side, and the boiler, an upright one, was on the other side, with the engineer sitting between them, not a choice seat in midsummer. These "dummies" with trailer attached seated 64 passengers. The trailers (old horse cars) had additional seats on the roof. A spiral ladder made of light iron was hooked on the rear of the car. 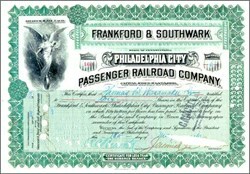 On April 1 1892 the Frankford and Southwark (Fifth and Sixth) Passenger Railway Company took possession of the Tenth and Eleventh (Citizens Line) Passenger Railway Company.